Nathan Vincent lives and works in New York City and received a BFA from SUNY, Purchase. His work has been exhibited in museums and galleries in the US and abroad, and has received attention in international publications. With residencies at the Museum of Arts and Design in NYC and 7 Below Arts Initiative in Burlington, VT, Vincent was also a finalist of the prestigious West Prize in 2008. In his artistic practice, Vincent explores power structures and the roles we play in society at large but also in our own smaller communities, constantly questioning the relationships between those worlds. 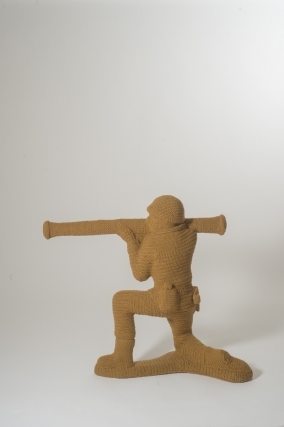 Through the medium of crochet he has moved across ideas of gender permissions and how societal constructs often dictate the roles we play to larger and more universal ideas of vulnerability, power and control, surveillance, and technology. Knitting and crochet have traditionally taken form to dress or envelop the body – in this way, humans have an undeniably strong physical connection with fiber. In Vincent’s fiber installations, this connection is explored, enhanced and pushed as the viewer encounters a familiar scenario of human proportions made completely of the craft materials you find in the banks of nostalgia. In creating his pieces, he is interested in the juxtaposition of craft and gender as well as the relationship of soft, malleable materials to firm, solid sculpture, pushing the boundaries of gender, medium and form. Vincent’s work with gender permissions and fiber comes together very succinctly and powerfully in the life-sized installation “Locker Room.” Not only was this a turning point for the conceptual aspects of his work, it was a launch pad for his artistic practice as he moved from single items reproduced in yarn to large scale installations that entice and encourage the viewer to move about the space and become a part of the piece. Crafting a stereotypically masculine space with a stereotypically feminine process brings to surface questions around activities that our culture deems acceptable for men and women. Traditionally, the locker room exists as an environment for men to be private and comfortable in. However there is often comparing, measuring up, and a sense of vulnerability and a general feeling of being inadequately masculine. 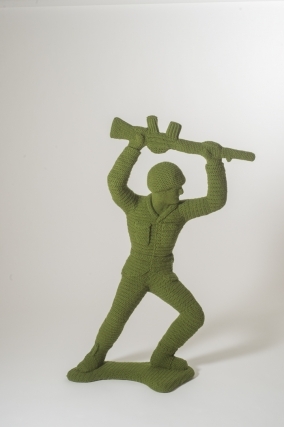 The obviously open construction and layout as well as the knit and crocheted objects speak to forced intimacy, vulnerability and point out the distance between the promise of a temple to masculinity and the reality of just how constructed gender roles truly are. 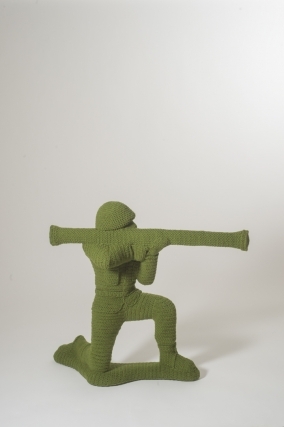 The crocheted bombs from the series “Threats”, or weapons, can be interpreted as tools of intimidation and symbols of the power one has over another. 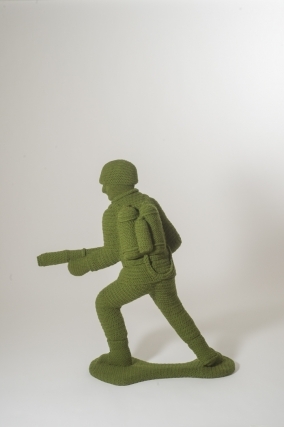 These crocheted bombs speak about the way in which we often equate threats with power, even when that threat is empty. Last but not least, the “Boy Toy” series seeks to point out the ways in which we create norms for children through the toys we give them, bringing forth the reality of gender training, which begins long before we realize. From endorsing aggression, to embracing the ‘desire’ for strength and power, to dictating the way in which children interact with one another, parents often unconsciously instill values and reinforce gender roles. It is Vincent’s mission to continuously question stereotypical ideas, through a medium that is both familiar and (made) uncomfortable, similar conceptually to gender constructs, thus inching closer to a truth no longer utopian, that of a fluid and flexible understanding of the world.